Establishing and naming the Range of a specific cell group is very useful when simplifying relationships and operations with a group of data. To be able to perform functions between them, we must name these cells. We will work with an example of a group of data which represents the sales of four products in a semester. 1) We shade the range we wish to name. For example, the month of February. 2) In the Names bar, right next to the Formula bar, we will write the name for this range. We will write February. 3) Press Enter on the keyboard and we will have named this range of data. Lets do two more examples. We will name the ranges for Hammers and nails. a) Shade all the data related to Hammers. 1) Shade all the data related to Nails. 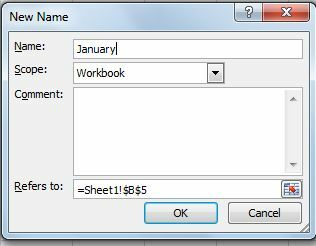 Another way to perform this function in an easier way is through the toolbar. We click on the Formulas tab on the Toolbar. A control box will open where we name the Range and we establish the data group that will form it. We select the group of data that will form part of this range. We do this by shading the corresponding cells in our worksheet. We click on Ok in the control box. We will have named our Range.